[miau] One thing you have to say about Play’n Go, when they design a new video slot game, they do not hold anything back. This is definitely the case with Myth. This slot game takes you back to a time where mythological creatures roamed the earth, and protected many of the riches that are still waiting to be discovered. That is where you come in. Try your hand at defeating these monsters in Myth, and you could be piling gold into your bankroll for days to come. 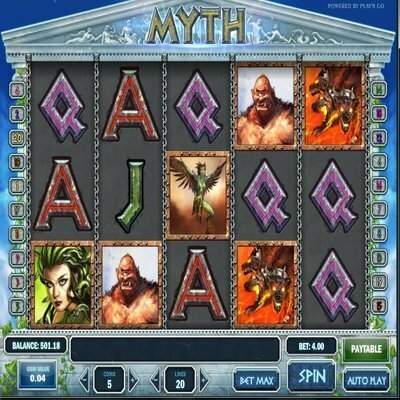 Myth is a 5 reel and 20 payline video slot game that incorporates all the things you would expect on a journey past some of the greatest monsters to ever call this planet home. Before you grab your weapons to fight these creatures, you need to know what you are up against. The lower paying symbols are the standard playing card characters, the Ace, King, Queen, Jack, and the Ten. Next up the pay scale you will find the green winged female demon, the dragon, the Cyclops, Medusa, and the Goat Demon. The soldier is wild and substitutes for all other symbols on a winning payline. Getting 5 of the wild symbols on a payline and you are rewarded with a generous 5000 coins. The sounds and graphics of Myth are equally impressive, but it is the bonus feature where you are going to want to spend your time fighting these monsters. The scatter symbol is a gold cup that is the key to you getting your hands on all that money. Getting three or more scatter symbols unlocks the 15 free games feature at a 3x multiplier. During the free spin bonus round, if you luckily capture 3 or more scatters, the feature is then retriggered and you get additional 15 spins added to your remaining free spins. As if all this wasn’t enough to help you acquire as many riches as possible, Myth still has another way in which you could grow your bankroll. After each successful spin, you get the opportunity to explode those winnings and fill your bags with gold. The gamble light will turn on if your have a winning combination. Press the gamble button and you are given two options. Choose the color of the playing card, you instantly double those winnings. Pick the suit of that playing card, you instantly quadruple those winnings. 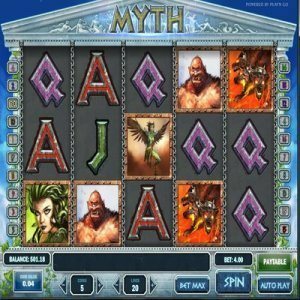 You don’t have to worry about being turned to stone when you look into the eyes of Medusa while playing the Myth Slot machine game. You only need be concerned with grabbing money at every opportunity. Thank goodness there are plenty of unique opportunities for you to get all that money being protected by these mythological monsters. With simple betting buttons and a cool autoplay feature, everything is lining up for you to score some serious winnings and escape Myth with more than just your life.